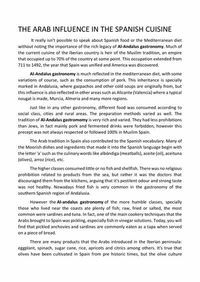 Did you know we owe the pickled food to the Arabs?. In Spain this way of preserving food is known as "ESCABECHE". And remember! If you visit Toledo someday, don't go away without taking our traditional marzipan, another arabian legacy in our cuisine. See the research work of our students of 6th grade.